New FAQ: How can I view expense reports once they have been paid? Posted by skyvu on Wednesday, June 13, 2018 in Expense Reports, News. Once an expense report is paid, it will no longer display on the main Travel and Expenses page in Oracle Cloud. 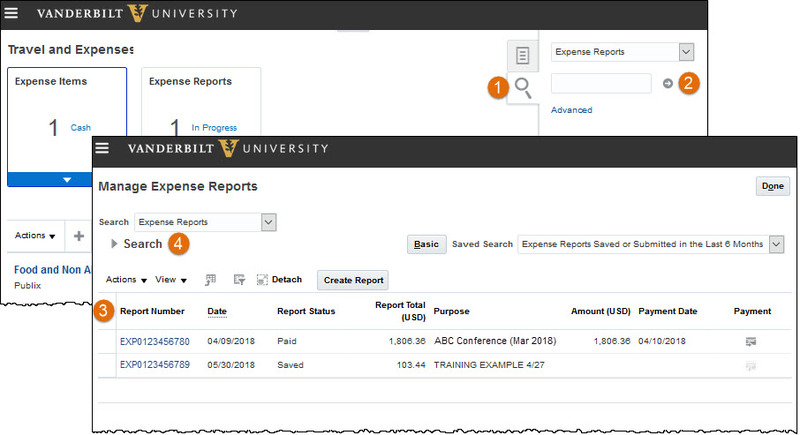 However, you can still search for and view these reports using the Search features within the Expenses module. This feature also allows for Expense Delegates to view prior expense reports of other users for whom they serve as a delegate. Click the magnifying glass icon on the right side of the Travel and Expenses page. Click the small gray arrow icon to go to the Manage Expense Reports screen. You do not need to enter or change either field to go to the next screen, but additional options are available to narrow your search as desired. You can use the Search options above the table to adjust the results displayed. This new FAQ has been added to Finance FAQs on the Employees and Line Managers resource page of the SkyVU website. This tip was contributed by Amber Miller, College of Arts & Science. Do YOU have a tip or trick to share? Please email them to us!